This State Trail represents a multi-county project to protect the natural resources and enhance the recreational potential of the Deep River. As of 2013, this land-based and paddle trail concept is still a conceptual trail with much coordination and planning ahead. The trail would begin at the river’s headwaters near High Point and Jamestown in Guilford County, and continue through Randolph, Moore and Chatham counties, before ending at the confluence of the Deep River and the Haw River near Moncure in Lee County. The trail could become the backbone of an extended regional trails system with connecting trails to Greensboro, Asheboro, the NC Zoological Park, and Jordan Lake, and could perhaps continue down the Cape Fear River to Raven Rock State Park and beyond. The corridor would link trails from state, local, private, and other public partnerships. On August 23, 2007, Governor Mike Easley signed Senate Bill 1431 establishing the Deep River State Trail within the North Carolina state park system. Two separate tracks in Chatham County, comprising approximately 944 acres and establishing the beginnings of the park, were obtained through partnership between the N.C. Division of Parks and Recreation and the Triangle Land Conservancy. The Deep River corridor is significant for its place in both the region's natural and human history. It is home to numerous animal species including rare fish (the Atlantic pigtoe mussel and the Cape Fear Shiner), muskrat, river otter, coyote and bobcat, as well as heron, bald eagles and osprey. 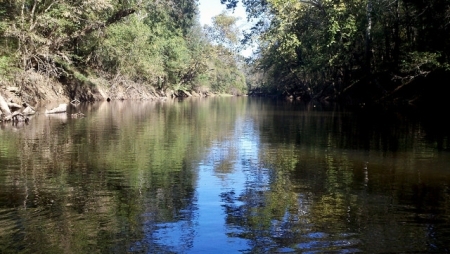 The river was important to the development of settlements for the Eno, Occaneechi, Shakori, Saura, and Sissipahaw tribes prior to European colonization. And then it became a resource for European settlers, providing the basis for industries such as coal mining in the state's largest coal field and then iron production, both in Lee County, and power for textile mills. State Parks Newsroom. "Gov. Easley signs bill authorizing Deep River State Trail." August 23, 2007. http://www.ncparks.gov/newsroom/press-releases/gov-easley-signs-bill-aut... (accessed September 9, 2015). NC Rail-Trails. "The Deep River Rail -Trail." 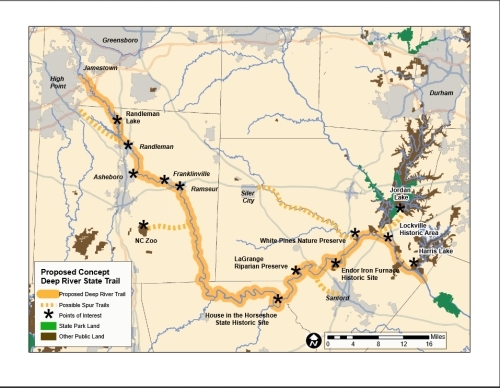 http://www.ncrailtrails.org/pdfs/DRRTConceptBrochure.pdf (acessed September 9, 2015). Triangle Land Conservancy. Deep River Paddling Guide. http://www.ncrailtrails.org/pdfs/DeepRivStateMap.pdf (accessed September 9, 2015). NC Rail-Trails. [Concept map showing the five-county Deep River State Trail corridor in North Carolina.] http://www.ncrailtrails.org/pdfs/DeepRivStateMap.pdf (accessed September 10, 2015). bobistraveling. Deep River Chatham NC 13-49-02_309. October 20, 2013. https://www.flickr.com/photos/bobistraveling/12307727545/in/photostream/ (accessed September 10, 2015).